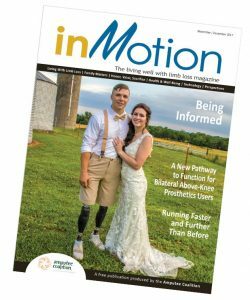 The November-December 2017 Issue of InMotion magazine, published by the Amputee Coalition, features an article on A New Pathway to Function for Bilateral Above-Knee Prosthetics Users, written by Chad Simpson, BS, BOCP, LP and Randy Richardson, ABC-CPA, RPA of Dream Team Prosthetics LLC. We present the article below for your reference with permission from the Amputee Coalition. Individuals with bilateral above-knee limb loss face a devastating reduction of mobility. Initially, a wheelchair is often used as the primary mode of transportation. A physical therapist will teach how to safely transfer to and from the wheelchair, maintain joint movement and overall strength, and help desensitize the limbs. An occupational therapist will help with accomplishing daily tasks such as personal hygiene and navigating daily life situations while using a wheelchair. In most cases, it takes several months for the surgical site to heal enough to begin the process of preparing for prosthetic use. During that period, the individual usually becomes accustomed to using the wheelchair and being in a seated position. Even family members will use the wheelchair to store and carry backpacks, purses, baby supplies, etc. The wheelchair becomes a vital device, not only to the amputee, but to the entire family. Once the limbs are healed, it can be difficult to focus on using prostheses after becoming comfortable with using a wheelchair. Unfortunately, due to lack of physical activity, individuals often experience substantial weight gain and develop exion contractures and stiffness in the hip joints, limiting the range of movement of the residual limbs. This general lack of activity and mobility greatly reduces overall strength. All of these factors can have a negative impact on the physical and emotional ability to use bilateral above-knee prostheses. Ultimately, the individual must decide whether to use a wheelchair or prostheses. Many bilateral above-knee amputees make the decision to use a wheelchair based on their own experiences, without knowing it’s even possible to be a full-time prosthetics user. Individuals with bilateral above-knee limb loss using prostheses have shown a 27-88 percent increase in energy cost during walking compared to individuals without limb loss. When energy expenditure outweighs functional benefit, bilateral above-knee amputees primarily opt to use a wheelchair and prostheses for special situations. The majority of veterans with bilateral limb loss prefer to use the wheelchair primarily, combined with other adaptations such as Segways, home and vehicle modifications and other motorized seated wheeled solutions for recreation activities. While these adaptations are wonderful for the individuals who need them, a growing number of bilateral above- knee amputees are driven to nd alternative solutions for improved function in their daily lives. For example, if a person chooses to use hand control adaptations in a vehicle, this limits them to one adapted vehicle. There are “portable” hand control options, but that requires carrying these devices wherever they go and installing and removing them when switching vehicles. But with certain advanced computer-controlled knee components, it is now possible to have a customized mode, set up by the prosthetist, to allow driving a vehicle without any adaptations. These bilateral prosthetics users are pushing the perceived limits to regain a higher level of mobility that allows them to go for a walk on the beach, carry their child on their shoulders, play golf, run in marathons, hike mountains and, most importantly, return to work, without using a wheelchair or special adaptations. 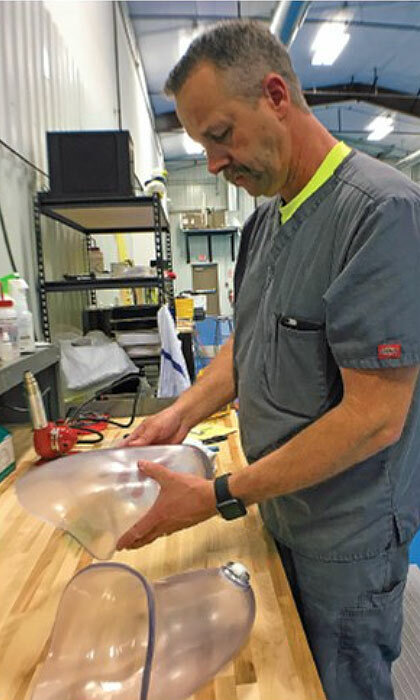 Hayden was working as an industrial HVAC repair specialist when he was involved in a single-car accident that claimed both legs above the knees. He suffered many internal injuries and was in a coma for several weeks. When he awoke, Hayden felt the uncertainty and anxiety about his situation and an overwhelming feeling of helplessness. He decided to focus his energy on nding a solution to his limb loss that would allow him to return to the things he loved to do, including working full-time, hunting, fishing, hiking, marrying his sweetheart and eventually starting a family. Today, Hayden does the same job he was doing before his injury. 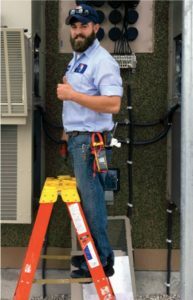 He regularly goes on service calls in harsh environments, servicing HVAC systems in remote cellular transmission tower electronics buildings, navigating stairs, hills, ramps and ladders, all while carrying tools and equipment. He does not own a wheelchair. Seth was 16 years old when he lost control of his pickup on a wet road. His vehicle rolled on top of him and crushed both legs. He spent a month in the hospital as the doctors tried to restore the blood flow to his limbs but ultimately, due to gangrene and internal organ failure, he had to make the decision to remove both legs above the knees or die. This was a devastating reality for Seth, who was a high school basketball and baseball superstar. 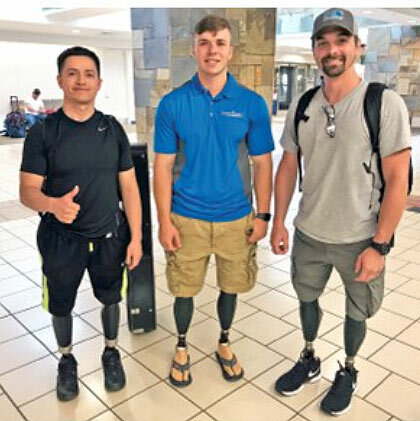 Seth attended a bilateral above-knee training camp five months post-injury and met numerous full-time bilateral prosthetics users, which inspired him to focus on regaining his own mobility. Today, Seth is married, works full-time, and is pursuing a degree in physical therapy. He participates in numerous running events, half-marathons, 5K, 10K and the 100, 200 and 400 meter events at the annual Endeavor Games. 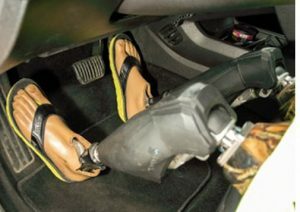 He drives an unmodified vehicle, using his prosthetics to safely go between the gas and brake pedals, allowing him to drive any car, including manual transmission vehicles. He hasn’t used a wheelchair since April 2012. Kyle was a railroad switchman at a Virginia steel mill. In September 2014, a rail car was sent down the wrong track and before Kyle could react, he was pinned beneath the car, resulting in severing both legs very high above the knees. Kyle was first successfully fit with shortened training legs (“stubbies”) that he used full-time for about six months, then with full-length legs with Genium X3 knees. He still switches between the knees and the “stubbies” for different activities. The key is selecting the most efficient tool for the specific activity. 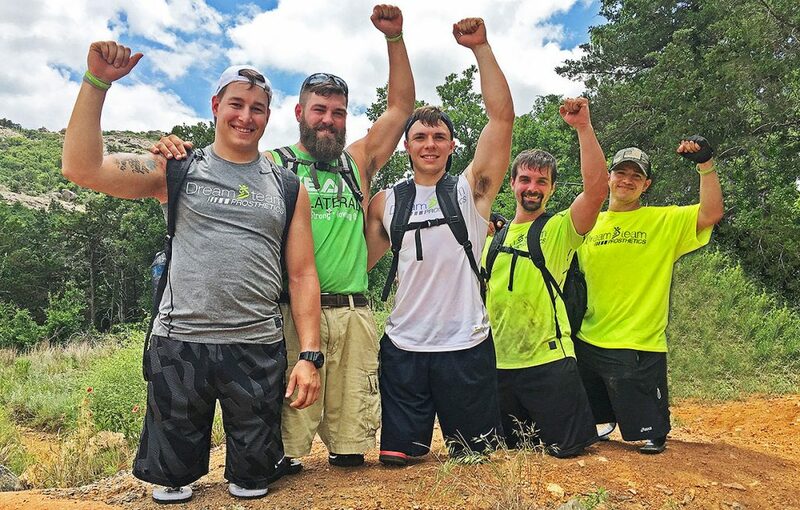 Kyle attends the annual bilateral training camp to help pay it forward to other uninformed bilateral above-knee amputees and show them what is possible. This year, he successfully completed a three-mile nature hike with the group. Kyle has not used a wheelchair since March 2015. 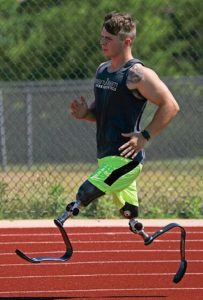 These individuals have tapped into their own internal passion, strength and determination to not accept the limitations of adaptive equipment, instead opting to adapt themselves to their situation. They have discovered that the more time they commit to using their prostheses, the more function and ability they enjoy in their lives. Mental determination (or stubbornness) to overcome daily challenges is paramount to a successful outcome. Initial full-time use of “stubbie” prosthetics will help build strength, balance and endurance. Keeping a positive attitude is crucial. When faced with bilateral limb loss, everyone wants to return to the level of mobility and independence that they had with their anatomical legs. However, once they experience the reality of the effort it will take to regain a high level of function on prostheses, many resign themselves to using a wheelchair. Many bilateral amputees report having an unfavorable first experience with prosthetics. Being unsatisfactorily fit with sockets or components that are not functional is frustrating, time-consuming and creates a negative attitude towards prosthetic use in general. Those who have obtained prosthetic success realize that you cannot compare one socket to the next; the skill and expertise of the prosthetist is what makes the difference. The turning point for bilateral above-knee amputees was the introduction of the Ottobock C-Leg. This technology provides the stability and consistent support of computer-controlled hydraulic yielding that enables the user to safely walk down a hill, down stairs or step off a curb. Learning to “ride” and control the hydraulic resistance and trust that the support will be there on each step is an obtained skill. A veteran once remarked that for him, stepping off a curb felt like stepping off a 10-story building. But with training and practice, it can become second nature. The additional programmable mode is used to set up a driving function to prevent the knee from collapsing when going between the gas and brake pedals. There is a wealth of information available online that shows what is possible, illustrated by other bilateral above-knee prosthetic users. The most important thing is to talk with full-time prosthetic users about what technology and training they have found to be successful. Find out what activities and ability they have in their daily life with using their prosthetics and the pathway they found to be most efficient for them. While advanced technology opens up many possibilities, never underestimate the skill, innovation and expertise of your prosthetist. Take the time to interview prosthetists and bilateral prosthetic users so you can make an educated decision for your own personal mobility and function. Your persistence and due diligence may just change your life!